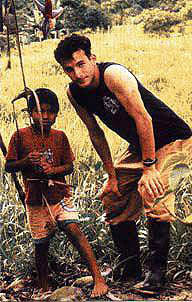 Terry Freitas poses for a photograph with an U'wa child during one of his visits to Colombia. The late Terry Freitas would have enjoyed drinking coffee and talking politics late into the night at the café that now bears his name. On September 20, this inviting, student-run nightspot, formerly known as Café Revolución, was rededicated as the Terry Freitas Café, commemorating an inspirational young alumnus who died while helping an indigenous people maintain its ancient culture. Terry Freitas's grandparents, Ethel Shelley and the late Dr. J. Joseph Shelley, made the rededication possible with a generous gift to Colleges Nine and Ten. "I am so fortunate to have a family of movers and doers—a wonderful, giving family," Ethel Shelley said before the ceremony, which drew a standing-room-only crowd of 85 people to the café. The space is stylish and comfortable, with burnished red, green, and white walls and chairs that invite hours of study, discussion, and contemplation. The donation establishes the first permanent endowments for both colleges, and will provide an array of student support. In addition, this campus hotspot was refurbished and will be able to expand its hours of operation to include daytime service. Previously, it was only open from 9 p.m. to 1 a.m. The renamed café will reflect the themes of College Nine (international and global perspectives) and College Ten (social justice and community) while presenting a range of music, spoken word, and artistic programs. UCSC Chancellor George Blumenthal said the gift is special for UCSC because it ensures that students will know about the life and work of Terry Freitas for many years to come. Freitas (Crown '97, biology, environmental studies) traveled to Colombia to work closely with the U'wa people. At the time, oil companies were threatening U'wa land with mineral extraction and development. After building a strong, sensitive, and trusting relationship with the U'wa over five years, Freitas helped set up the U'wa Defense Working Group while organizing to stop drilling on U'wa lands. His life and work were soon cut short. In 1999, armed assailants kidnapped Freitas and two colleagues while they were heading toward a Colombian airport, where they planned to catch a plane for the United States. The revolutionary FARC group admitted the killings but called them a mistake. Freitas was 24 at the time of his death. Terry's mother, Julie Freitas, a doula and a childbirth educator, reflected on her son's bravery and compassion. "He was among the many UCSC graduates who dedicated their lives to doing things that seem extraordinary. How bright, how courageous," she said. "'I couldn't do that,' you may think. But every day presents opportunities." She spoke of the great things good people can do by small interventions and acts of kindness that may seem insignificant but have far-ranging impacts. UCSC environmental studies professor Daniel Press worked closely with Freitas, and had him as a student in a policy course and a writing class he taught with environmental studies lecturer Sarah Rabkin. Terry's desire to help others could drive him to take on ambitious projects, but it also brought about smaller gestures. Once, when Press was a new father and had been up most of the night attending to his infant daughter, Terry noticed his exhaustion and gave Press a homemade mug to "perk him up." To this day it sits in a place of honor in Press's office. "He understood that the world is hurt, and in great need of healing," Press said. "He was a very bright man, with many skills, but it was all tempered by this wonderful and humble character." During the ceremony, Melina Selverston Scher (Merrill '89, sociology), an author and advocate for environmental causes and the rights of indigenous peoples, drew a strong connection between the café sustaining Terry's name for generations, and the U'wa keeping Terry Freitas's name alive. "They don't have a written history. They have an oral history. They sing their history, and Terry is in the song," she said. Scher also told the crowd that Terry continues to live on in the songs of the U'wa people he loved. She spoke of the way he reached out to a people "that needed to not be alone. It's hard to do that. I think UCSC is special because it teaches us that. In this world of fame, of making as much money as you can, we are taught to be part of the world and take responsibility for part of the world." In closing, she said, "I don't know if you know this, but Terry won. The U'wa won. There is no Shell Oil in the U'wa territories right now … his short, deep life changed the world."